While the war was being fought in the Philippines and Okinawa, plans were ripening rapidly for the largest amphibious operation in the history of warfare. "Downfall," the grand plan for the invasion of Japan, contemplated a gargantuan blow against the islands of Kyushu and Honshu, using the entire available combined resources of the army, navy, and air forces. As was to be expected in the consideration of an assault of such magnitude, there were numerous and varying opinions as to the best strategy to follow in developing the final plans. These different opinions flowed into two main channels of thought. On the one hand, it was felt that much more preparation was needed than would be possible under the tentative target dates of 1 December and 1 March for the Kyushu and the Honshu operations. To reduce the risks inherent in any assault on the well fortified and strongly garrisoned islands of Japan, a preliminary and far-reaching campaign of air-sea blockade and bombardment was advocated. To implement such a concept, prior operations along the China coast at Chosan and Shantung, in Korea, and in the Tsushima Strait area were envisaged. Such a strategy, it was held, though admittedly more prolonged than direct assault, would minimize the number of casualties, further reduce hostile air potential, and cut off reinforcements from Asia to Japan. Furthermore, it was conceivable that such a program could force Japan's surrender without the necessity of a major landing on the Home Islands. vantage of deploying the bulk of available resources off the main axis of advance. Such a course would fail to increase short-range air coverage of vital portions of the Japanese islands and yet, by spreading Allied strength in the Pacific over a wide area, would prevent an attack on the Japanese mainland until after redeployment from Europe could be accomplished. General MacArthur also expressed the fear that United States forces would become progressively more involved in the China area, perhaps necessitating a further postponement of the Honshu operation. From the standpoint of weather, which was a determinative factor in any plan for operations again Japan, General MacArthur thought that the Kyushu assault should be made in November rather than December and suggested that the tentative date for "Olympic," previously adopted by the Joint Chiefs of Staff, be moved forward one month. The concept of "Downfall" visualized attainment of Japan's surrender by two successive operations: the first, to advance Allied land-based air forces into southern Kyushu in order to develop air support for the second-a "knockout blow to the enemy's heart in the Tokyo area. "13 These operations would be expanded and continued until all organized resistance in the Japanese Home Islands could be brought to an end. It was also assumed that, at the initiation of the assault, United States forces would be established on the Bonins-Ryukyus line. It was estimated that by then land-based planes would have attained air superiority over southern Kyushu while the U. S. Pacific Fleet, operating from forward naval bases in the Philippines, Ryukyus, and Marianas, would dominate the waters east of Japan and the southern part of the East China Sea. By mid January 1945, it had become apparent to the Japanese High Command that a new and comprehensive defense policy was imperative. On 20 January, Imperial General Headquarters issued an outline of policy for future military preparations. After first stating that the final decisive battle would be waged in Japan Proper, the outline called for an immediate fortification in depth of Japan's defense perimeter. 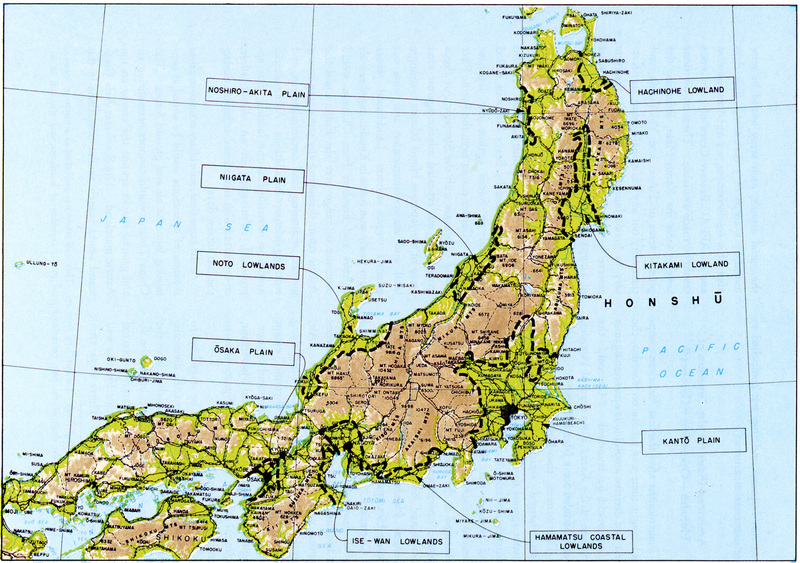 Included in this perimeter were Iwo Jima, Formosa, Okinawa, the Shanghai region, and the south coast of Korea. Resistance in the Philippines was to be maintained as long as possible to delay the advance of the United States forces toward these key positions. While this outer perimeter was being assaulted, the forces in the Homeland would bend every effort to complete preparations for the decisive battle by early Fall of 1945. In April 1945, the accelerated preparations for the defense of the Homeland brought about a reorganization of the Japanese army command. The problems raised by the increasing numbers of troops in Japan, the slow-up of defense preparations caused by the lack of manpower and materials, aggravated transportation difficulties, together with the need for co-ordination of operational and administrative functions, made it necessary to simplify the command system. Almost immediately after the stepped-up home defense program was instituted, American air raids became increasingly severe. Transportation and production facilities were greatly damaged and defense preparations were seriously handicapped. It was almost impossible for the Japanese to put up any effective defense against these air attacks. 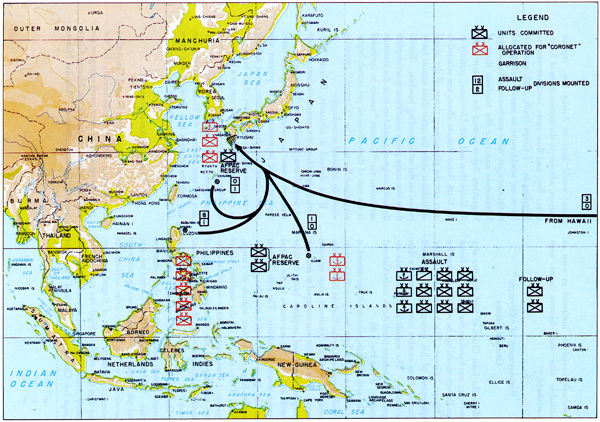 The loss of the Marianas and the Ogasawara chain, left Japan without bases from which to carry out patrolling activities and, consequently, the Japanese air forces had little or no warning of impending raids. In addition, the small number of planes being produced had to be carefully husbanded for the forthcoming great battle in the Homeland and could not be committed to immediate air defense. and the large-scale air raids over their main cities, it became increasingly evident that Japan was in desperate straits-and that the time was fast approaching when the war would be waged in their own islands. 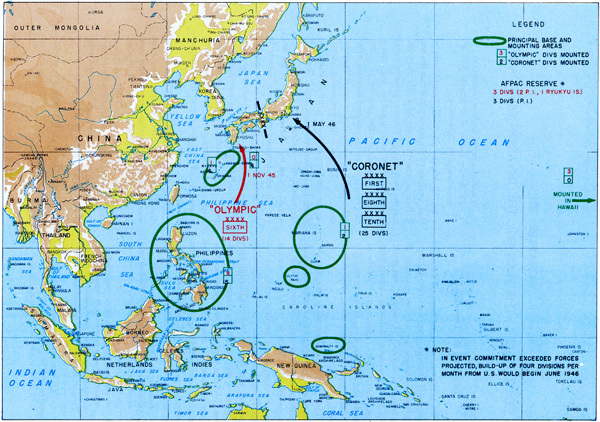 Before any extensive defense measures could be put into effect, the Japanese High Command had to formulate a concrete estimate of Allied intentions. Only by an accurate assessment of the timing and strategy projected in United States plans and by a correct disposition of their own strength, could Japan's military leaders hope to upset or repel an invasion of the mainland. Opinions within Imperial General Headquarters differed on the question of impending Allied operations. 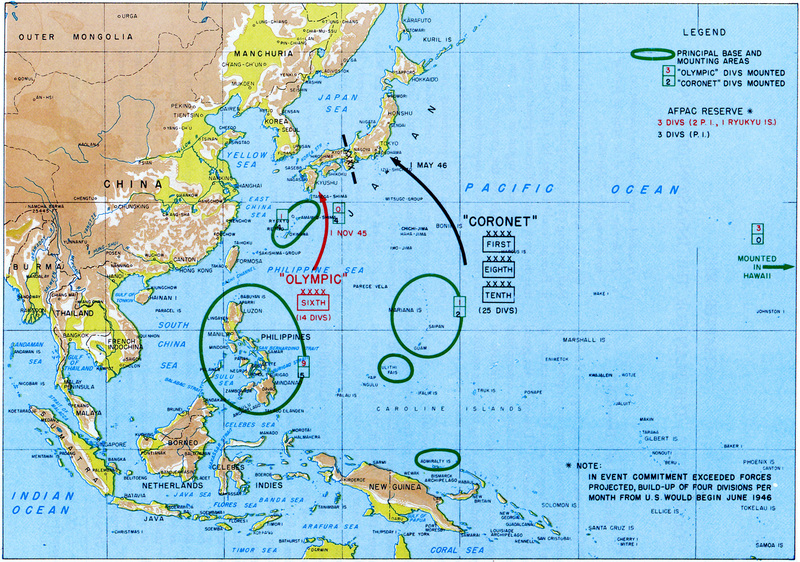 The various views fell into two main categories: one maintaining that the United States would initiate a long-range program of intensified blockade and strategic air bombardment to destroy completely Japan's combat potential, while the other considered that the war would be brought to a decisive stage by an immediate amphibious invasion of Japan Proper. Although these two possibilities were injected into all discussion on strategy, they were not given equal prominence. The majority of Japan's military planners adhered consistently to the latter view-that an Allied invasion in force would be launched as soon as the necessary men and ships could be massed. In general, the time of the southern Japan operations was placed in the Fall of 1945 and the date of the decisive Kanto Plain operation, in the Spring of 1946. The date of invasion, the Japanese thought, would depend to a large degree upon the number of troops and the amount of shipping the United States considered necessary for large-scale successful landings. It was calculated that by the Fall of 945, the United States would be able to mount a total of thirty divisions for amphibious operations against the Homeland and that a cumulative total of fifty divisions could be massed by the Spring of 1946.
north to south and has a general width of about 80 to 120 miles from east to west. More than three-quarters of its territory consists of mountainous terrain, with a few plainlands scattered along the coasts. The road net running across the island was limited and in poor condition. (Plate No. 115) The Kokudo or national highway was a euphemism for a single-loop, two-lane gravel road, badly torn by the heavy military traffic in constant flow over its surface. 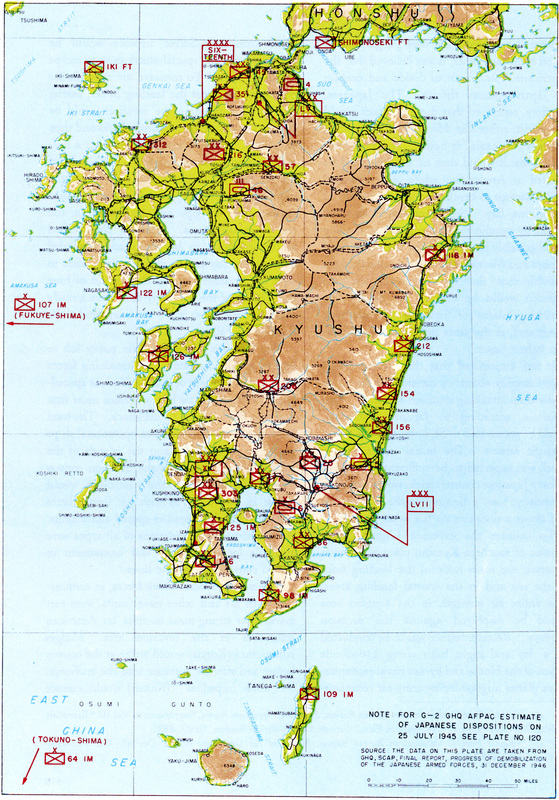 The highway was built along the island's coast, running on the west down to Kushikino, cutting across to Kagoshima, along the north bay to Miyakonojo, thence north and east to Miyazaki and finally up the east coast. The inland prefectural roads were, for the most part, one and a half lanes wide interspersed with frequent "passing" locations and suitable for light transport only. The remaining roads were narrow, primitive, one-way dirt tracks virtually impassable in wet weather. 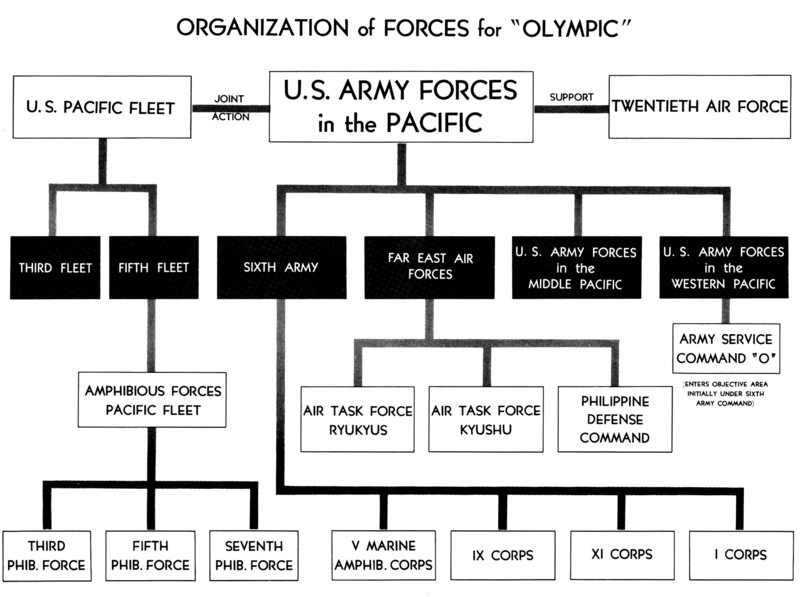 Organization of Forces for "Olympic"
It was intended that these air raids be intensified with the approach of the target date to culminate in an all-out effort from X-10 to X Day. These last ten days before the landing phase would see the massed bombing power of all available planes, both land and carrier-based, directed in a mighty assault to reduce the enemy's defenses, destroy his remaining air forces, isolate the objective area, and cover the preliminary mine sweeping and naval bombardment operations. The fortifications within the selected landing areas would be smothered under tons of explosives, while naval vessels and engineer units moved in to eliminate underwater mines and barriers. Supported by such overwhelming and concentrated power, it was expected that the amphibious forces would be able to stage the assault landings without unreasonable losses. Two main deception efforts were planned, one strategic and the other tactical. To encourage the belief that Allied attention was focused primarily on the Asiatic coast and the Chusan Archipelago, the China Theater Command and the Southeast Asia Command would conduct diversionary ground movements in China and in the Malay Peninsula. The tactical diversionary effort would be made by a feinting blow against the island of Shikoku. A floating reserve of two divisions, a part of the Main Attack Force, would appear off eastern Shikoku from X-2 to X Day and then, after its deceptive mission was performed, would proceed to the Ryukyus to be available for reinforcement call. On X Day, three corps would effect simultaneous assault landings in the three objective areas. 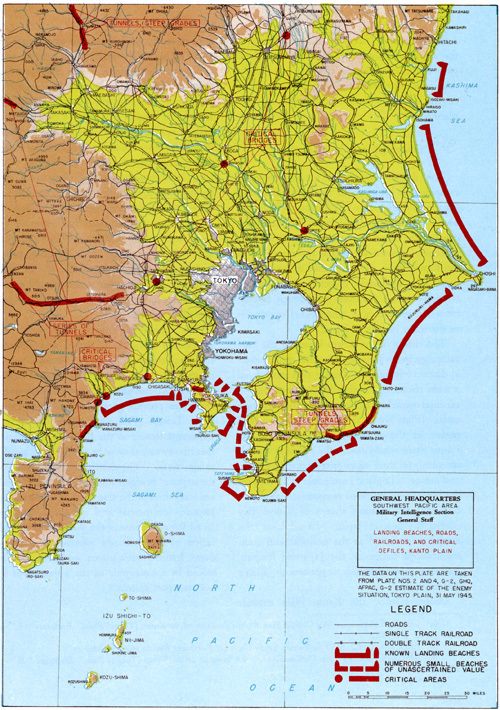 V Marine Amphibious Corps (3rd, 4th, and 5th Marine Divisions) would go ashore in the vicinity of Kushikino, drive eastward to secure the western shore of Kagoshima Bay, and then turn north to block the movement of enemy reinforcement from upper Kyushu. XI Corps (1st Cavalry, Americal, and 43rd Divisions) would land at Ariake Bay, capture Kanoya, advance to the eastern shore of Kagoshima Bay, and then move northwestward to Miyakonojo. 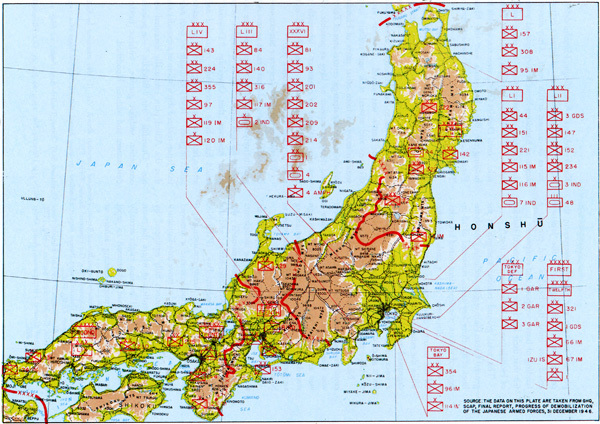 I Corps (25th, 33rd, and 41st Divisions) would make its assault at Miyazaki on the east coast, move southwestward to occupy Miyakonojo and clear the northern shore of Kagoshima Bay to protect the northeast flank. XI Corps (81st and 98th Divisions), initially in the Sixth Army Reserve afloat, was selected to carry out the diversionary threat off the island of Shikoku while the other three assault forces moved on the actual landing beaches. Should these four corps prove insufficient to accomplish the tasks assigned, a build-up from the elements earmarked for "Coronet" would be instituted at the rate of three divisions per month beginning about X+30. The "Coronet" operation would be adjusted accordingly. 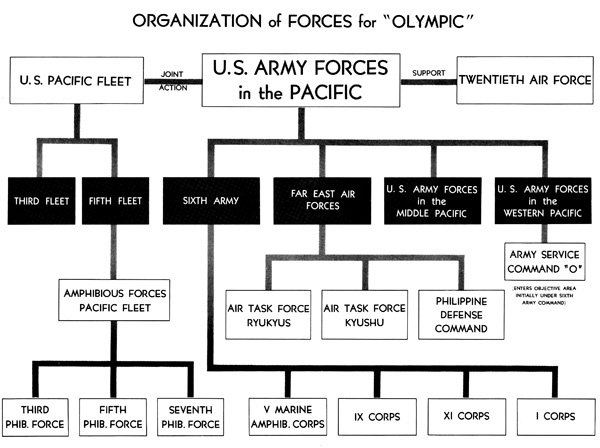 Staging of Forces for "Olympic"
Manila was designated as the base to provide the initial supply of troops being staged in the Western Pacific, and Hawaii was selected to perform the same function for troops sent out from the Middle Pacific. Re-supply and the bulk of construction materials would come directly from the United States, augmented as necessary from Pacific bases. 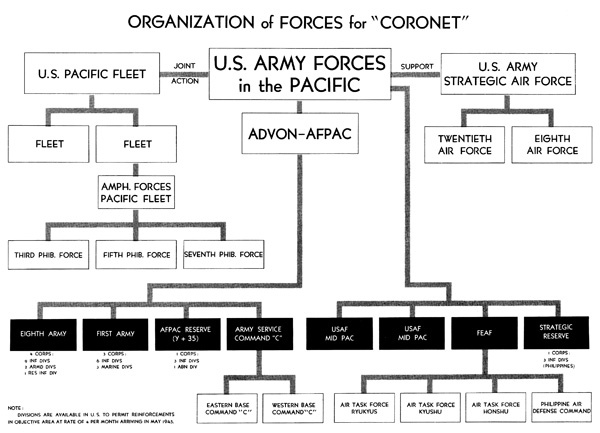 AFWESPAC was made responsible for organizing Army Service Command "Olympic" to provide logistic support within the Kyushu combat zone. A cardinal problem confronting General MacArthur before every operation was the question of enemy dispositions and capabilities in the projected invasion area. The following extracts from the intelligence estimate prepared for "Olympic" provide an excellent illustration of the comprehensive preparation and staff work that preceded a major military campaign. By the end of July, General MacArthur had a fairly complete picture of what to expect when his forces invaded Kyushu. To keep this picture up to date, new information was filled in as rapidly as it was received from the various intelligence sources. "Although the Japanese obviously regard the Tokyo Plain as the ultimate decisive battle ground, it is apparent that Kyushu is considered a critical sector on their planned Empire Battle Position. It is believed that plans will visualize assignment of about 6 combat divisions (plus 2 depot divisions) to garrison Kyushu initially and that they are prepared to expend up to 10 divisions, all they can tactically employ in the area to insure its retention. Depot facilities to maintain such a force would have been established in Northern Kyushu. 57 Corps: Established Headquarters at Takarabe (Miyakonojo Basin) during period April-June 1945. Believed responsible for defense of Southern Kyushu, i.e., of area south of central mountain mass. 56 Corps: Headquarters established at Iizuka (east of Fukuoka) during June 1945. Probably responsible for defense of area north of central mountain mass.
" 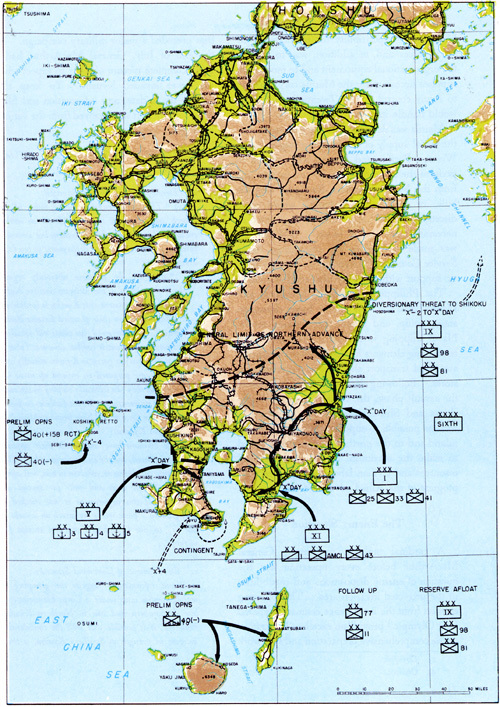 These factors (detailed discussion of critical defiles traversed by east and west coast road and railroad routes from Northern to Southern Kyushu and the part-way alternate route Yatsushiro-Kokubu)-lead to the conclusion that the blocking of a limited number of defiles, i.e., destruction of critical bridges, tunnels, cuts, and fills, by concentrated aerial bombing and vigorous maintenance of interdiction by both air and naval bombardment will render it exceedingly difficult for the Japanese either to reinforce Southern Kyushu with elements of the Northern Kyushu Garrison, or to supply and maintain their forces which are in Southern Kyushu prior to the blocking of their only two lines of overland communication." "Effective interdiction of both coastal routes and the alternate route from Yatsushiro through concentrated aerial bombing and/or naval gunfire would reduce overland reinforcement from Northern Kyushu to a mere trickle as long as maintained. Laborious passage of blocked defiles and long overland marches would be required.... It is probable that the Japanese may resort to night barge movement. An ample supply of small coastal craft is available and their tactics have long stressed the use of this means of troops transport.... Effective air and sea control should limit if not prevent the use of this method...."
"Reinforcement from Honshu: Troops from this source would probably be moved into Northern Kyushu via the Shimonoseki Tunnel or by night overwater movement; however, their subsequent movement to Southern Kyushu would be subject to the same restrictions that apply to Northern Kyushu garrison. Overwater movement across the Bungo Channel direct to Nobeoka or points south thereof should be easily prevented by air and/or naval action." a. The rate and probable continuity of Japanese reinforcements into the Kyushu area are changing the tactical and strategical situation sharply. At least six (6) additional major units have been picked up in June/July; it is obvious that they are coming in from adjacent areas over lines of communication, that have apparently not been seriously affected by air strikes. There is a strong likelihood that additional major units will enter the area before target date; we are engaged in a race against time by which the ratio of attack-effort vis-a-vis defense capacity is perilously balanced. b. The Japanese have correctly estimated Southern Kyushu as a probable invasion objective, and have hastened their preparations to defend it. c. They have fully recognized the precarious nature of the land and sea routes by which they must concentrate and support their forces in Southern Kyushu. They are vigorously exploiting available time to complete the deployment and supply lines of strong forces in the area before they are deprived of the full use of their limited lines of communication. large concentration of troops, and the movement of defensive material has undoubtedly so strained the capacity of all existing lines of communication that any major interruption thereof would seriously reduce the effectiveness of the enemy's preparations. It is also probable that some of the new units identified in Southern Kyushu are not yet fully assembled and that at least one division (the 212th) which was probably formed of local volunteers has not yet been completely equipped. e. The assumption that enemy strengths will remain divided in North and South (Kyushu) compartments is no longer tenable. f. The number of enemy major units rapidly tend to balance our attack units. g. The trend of reinforcements from North to South (Kyushu) is unmistakable. h. Massing in present attack sectors is apparent. Shifting the emphasis of defense to Kyushu necessitated a postponement of military preparations in the Tokyo-Yokohama area. 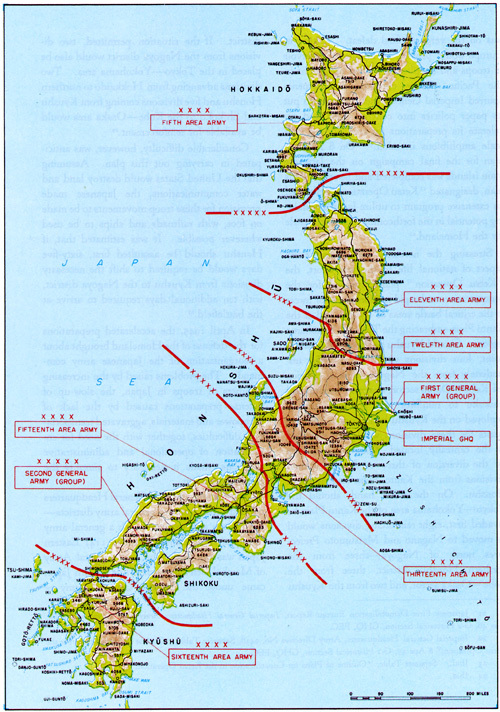 The Japanese feared that if the invasion of the Kanto region should be initiated immediately after the Kyushu attack, or if Honshu should be assaulted directly, an adequate defense could not be made since most of the Japanese air and naval power would already have been committed to Kyushu. For this reason, Imperial General Headquarters were reluctant to transfer ground strength from the capital city area until the very last moment. Although air and sea preparations were being pushed in Kyushu, and supplies and munitions were being moved southward, the Japanese. held up the scheduled commitment of troops to that area pending further developments. They assumed correctly, however, that the first aim of the United States would be the annihilation of the Japanese forces on the southern Kyushu front and the occupation of strategic air bases and harbors in Miyazaki and Kagoshima Prefectures. 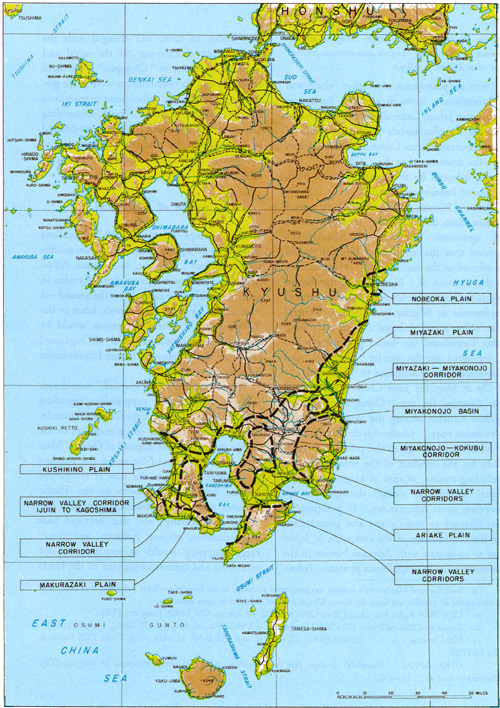 Following the invasion of Tanega Shima, where a fighter base would be installed, it was considered probable that the American forces would direct their main attack against the Shibushi area on the Ariake Bay front and the Sumiyoshi coast on the Miyazaki Plain. A secondary attack was expected on Fukiagehama on the Satsuma Peninsula. Since these three areas were geographically cut off from each other, it was believed that the Americans would seek to divide and contain the Japanese units therein. The Japanese, therefore, estimated that the first attack would be against either the Miyazaki Plain or the Satsuma Peninsula, or both. The main force of the assault would then in all likelihood be directed at Ariake Bay while other elements would attempt to break through the mouth of Kagoshima Bay. Simultaneously with these attacks by ground forces, an airborne landing would possibly be made on the airfields around Kanoya and Miyakonojo. It was also thought probable that the Tosa Plain of southern Shikoku would be invaded to destroy the launching places of Japanese special-attack planes and, at the same time, establish American fighter bases. The Japanese Navy had little power left to oppose an Allied assault. Its remaining forces consisted of a variety of small underseas special-attack craft and a few heavy surface units that had been hidden from Allied attack. 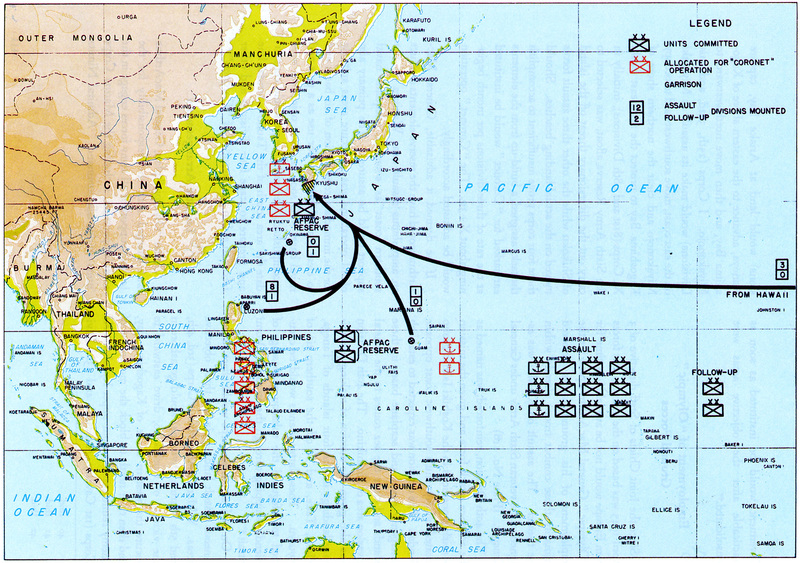 The total destroyer strength of nineteen operational ships was to be distributed along the islands of the Inland Sea . As soon as the invasion convoy entered its anchorage, the destroyers would attack in co-ordination with air force planes and surface and underwater special-attack units. About thirty-four submarines of all types were available for patrol duty and harassment of Allied convoy and supply lines. Land preparations on Kyushu in June and July were largely inadequate and an Allied assault at that time would have found Japan's defenses generally incomplete. In their planned policy of playing for time, the Japanese were aided by the strong resistance on Okinawa, which they felt would further delay the invasion date. Utilizing this needed interval, the Japanese implemented their operational plans and hastened to complete all defenses and to co-ordinate all activities for the objective of "annihilating the enemy on the beaches through offensive action. "51 Every effort was bent toward this goal and it was estimated that all steps to meet the invasion would be completed by November. By mid July 1945, the Fortieth Army was deployed along the Satsuma Peninsula in southwest Kyushu below Sendai. The Fifty-sixth Army occupied northern Kyushu, with most of its strength distributed along the northwestern coast from Moji to Sasebo. The Fifty-seventh Army was responsible for the defense of the southeast and was concentrated in the Miyazaki Plain region. 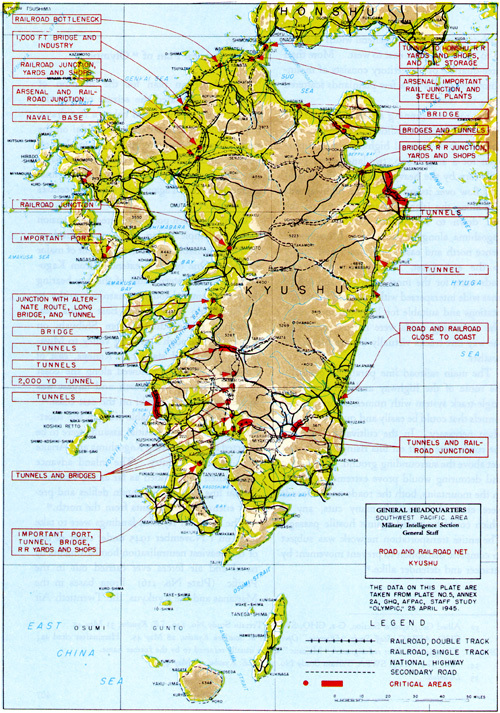 The total strength assigned to the immediate defense of Kyushu amounted to approximately 7 line-combat divisions, independent mixed brigades, and 3 tank brigades.52 Three divisions and 2 tank brigades were kept in mobile reserve in south central Kyushu to be moved at an instant's notice and concentrated at the points of amphibious invasion. The Japanese tactical plan called for a rigid defense of the beaches which would be reinforced as rapidly as units could be sent from other parts of Kyushu and the western regions of Honshu. The ridges immediately to the rear of the anticipated landing areas were fortified by a network of large caves and tunnels covered by a series of strong artillery and mortar emplacements and manned by large forces of coastal-combat ground troops. These troops would meet the first assault waves and, together with the line-combat divisions, would endeavor to hold all positions until the arrival of the mobile reinforcements at the beach battleground. If the primary target of the Allies could be ascertained before the landings, then the main Japanese forces would rush to that point. If the Allied target should be unclear or if all points should be invaded simultaneously, then the main enemy strength would be committed to Ariake Bay, while delaying actions were fought on other fronts. In all cases, the decisive engagement would be waged in the beach areas with all available forces moving toward the southern Kyushu coasts. The whole object of the Japanese was to repel the invaders before they could put their heavy armor and artillery ashore. Organization of Forces for "Coronet"
tion was desperate and they felt compelled to use desperate measures. American Plans for the Invasion of Honshu-Operation "Coronet"
Two armies, the First and the Eighth, were charged with the second mammoth assault against the heartland of Japan. Their immediate mission was to destroy all opposition and occupy the Tokyo-Yokohama area. General MacArthur would exercise personal command of the landing forces and direct the ground operations on the mainland. With him would be the advance echelon of his General Headquarters to act as the Army Group Headquarters in the field. The initial landings would be staged by 10 reinforced infantry divisions, 3 marine divisions, and 2 armored divisions. Launched from the Philippines and Central Pacific bases, the attacking forces would be constantly protected by ships and planes of the Pacific Fleet as well as by land-based aircraft. Thirty days after the initial assault, each army would be reinforced by a corps of 3 divisions. Five days after this reinforcement, an airborne division and an AFPAC Reserve Corps of 3 divisions would be made available. 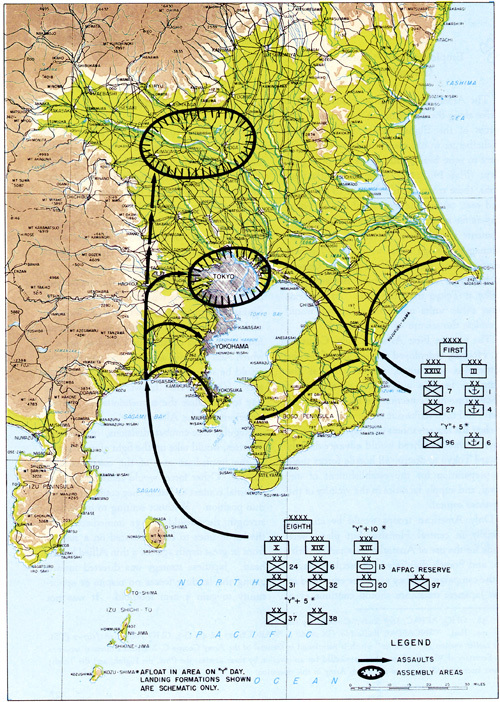 These 25 divisions were to seize the Kanto Plain, including the general areas of Tokyo and Yokohama, and then carry out any additional operations necessary to break Japanese resistance. Strategic reserve for the entire operation would consist of a corps of 3 divisions located in the Philippines and a sufficient number of divisions from the United States to permit reinforcement at the rate of 4 per month. The amphibious assault against Honshu would be preceded by heavy blows of Allied naval and air forces against the Japanese Empire. Carrier planes from the Pacific Fleet would co-operate with the Strategic Air Force in carrying out repeated attacks against vital areas of the Japanese Home Islands to strangle land and sea communication and wipe out selected targets ashore. 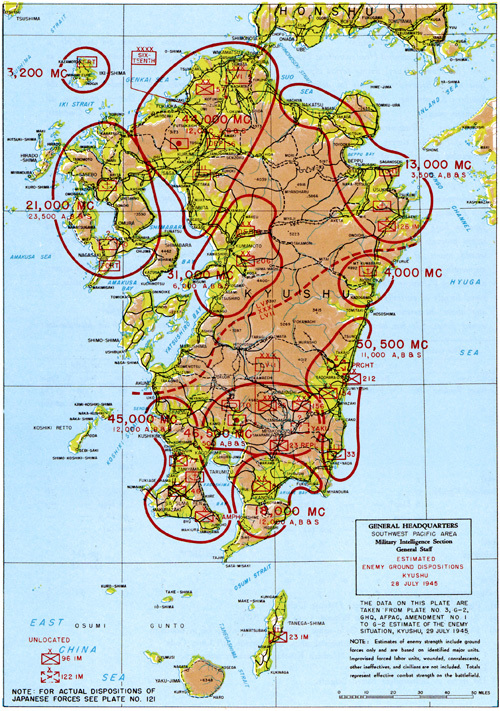 Land-based planes from newly won fields in Kyushu together with fighters and bombers from Okinawa would continue to range over the Empire and the Asiatic coast, destroying any remaining enemy aircraft, shattering land communications, and reducing defensive installations. All air attacks would be intensified as the landing date approached, culminating in an all-out effort, co-ordinated with naval bombardment, during the last fifteen days. southern areas. Naval and air forces based in the Aleutians would be called upon to lend general support wherever possible. All plans were directed toward the successful execution of the greatest amphibious operation ever planned. The decisive operation in the projected campaign to bring about the final collapse of Japan was the invasion of Honshu. (Plate No. 122) The total defeat of Japan's armies in the core of the Empire was the over-all primary objective. In the event that the campaign in the Kanto Plain did not prove to be the last battle, the secondary objective would be achieved-secure positions from which to continue air, ground, and amphibious operations in the main islands of Japan. The veteran First Army of Gen. Courtney H. Hodges, redeployed to the Pacific from the battlefields of Europe, would strike at the Kujukuri beaches about fifty miles east of Tokyo, provide protection for the northeastern flank, and then strike out to the west and south to clear the eastern shores of Tokyo and Sagami Bays. One spearhead would advance directly toward Tokyo to destroy all hostile forces there in preparation for the establishment of air, naval, and supply facilities in the vicinity of the Japanese capital. By mid June 1945, Japanese plans for the vital campaign in Honshu envisioned an all-out battle on the main beaches leading to the Kanto Plain. Kashima-nada, Kujukuri-hama, and the head of Sagami Bay were regarded as the crucial areas to be held at all costs against an amphibious invasion. Of the three beaches, Kujukuri-hama was selected as the area where the prime initial effort of the Japanese forces would be concentrated. The general strategy called for the coastal-combat divisions to send their entire resources against the American assault head-on, with the underlying objective of merging all lines into an interlocking and continuously fluid struggle in which American air, artillery, and naval gunfire would be seriously hampered in choice of targets. It was felt that this was the only possible way to neutralize the tremendous air and sea superiority of the Allies. No definite provisions were made for the employment of air power in the event Honshu was assaulted in the spring of 1946, since it was anticipated that the Kyushu campaign would have consumed Japan's entire remaining air force. Special-attack surface craft were to be utilized to the fullest extent. Whether or not these desperate but extensive defense measures would have made an invasion prohibitively expensive in American lives is a matter for speculation. It is reasonable to assume, however, that Operation "Downfall" could have been successfully concluded only after a hard and bitter struggle with no quarter asked or given. It was fortunate for both sides that Japan realized the wisdom of surrender and that the Allied plan eventually executed was not "Downfall" but "Blacklist"-a peaceful occupation without gunfire, without further destruction, and without bloodshed.